An antique dress softens the black and white photos underneath. Found objects stitched on top. Kathrine Allen-Coleman creates mixed media paintings using elements of collage, printmaking, black and white photography and stitching or embroidery. 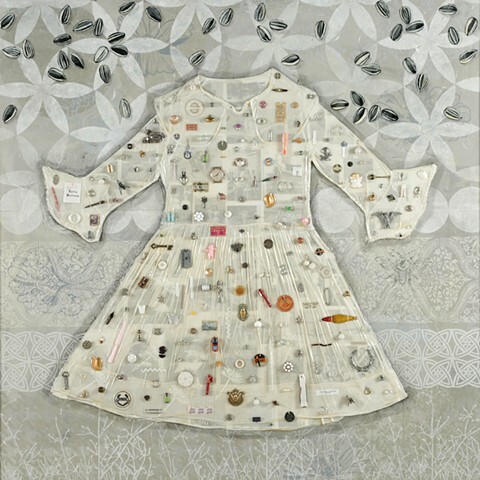 Her Dresspainting series includes garments with stories. Which are often, but not always from the perspective of women and girls. A Canadian by birth, Kathrine has been transplanted to the Southeastern US. She travels to several art festivals each year throughout the country, and is enjoying every minute of it.